This is an interesting watch from Zodiac. 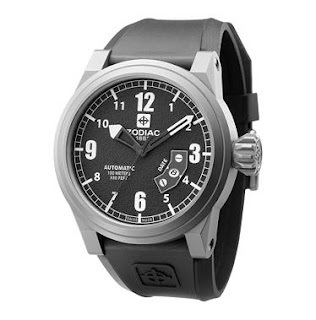 It is the ZMX 04 ZO8510 watch from the ZMX series of watches from Zodiac. The ZMX collection is the heart and soul of Zodiac. It has bold and daring design. The ZO8510 does just that. To me, it looks like a modern take of the evergreen Aviator watch design. The design of the watch is very industrial and looks very robust. I like the dial which is textured and the date window which looks like it has been screwed on. The lume is rendered in white lume and I suspect the Arabic number hour marker are all lumed as are the tips of all three hands. The crown is large and the grooves are cut deep. It makes operating the crown tactile and easy.